Residents of more than six Nairobi estates yesterday sought to stop their eviction by the government. Houses are to be demolished today in Kaloleni, Makongeni, Mbotela, Mutindwa, Dandora and Kenyatta University villages, Lang’ata and Wilson-South C link road reserve. Moses Nyakiongora served residents with the notice on July 19. He is the National Buildings Inspectorate secretary and chairman of the Multisectoral Committee on Unsafe Structures. The government said the houses are on Kenya Power and Kenya Railways reserves. But in a class action suit, eight residents requested a city court to stop the planned evictions and uphold their right to dignity, proper housing and education, among others. Magdaline Njeri, Jane Ruguru, Rose Odhiambo, Beatrice Kageha, Jenipher Apondi, Priscilla Wawira, Micheal Njiru and John Mungai said thousands of people would be rendered homeless. Students’ right to education would also be undermined, they said. In court documents, they said the evictions will hurt learning, church services and businesses. Katiba Institute supported the suit. The complainants said Nyakiongora has no power to issue an eviction notice regarding buildings on public land reserves. Such a mandate rests with the National Land Commission, they said. They also said the notice did not adhere to the procedures laid down in law and instead exposes them to forced eviction. Under the law, the NLC should notify those to be evicted at least three months before. This should be through a Gazette notice, a national newspaper, or radio announcements in a local language. On July 21, the government, through the Kenya Urban Road Authority, demolished houses in Kibera to make way for the proposed Ngong’-Lang’ata road linkage. Some 30,000 people were left homeless. The case had yet to be scheduled for hearing. 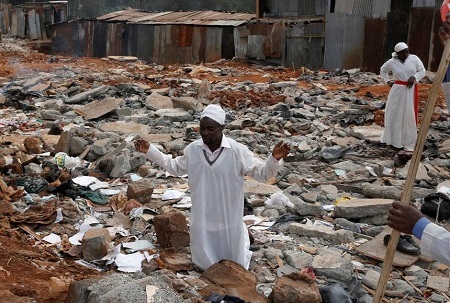 Photo: Worshipper in Kibera slum, Nairobi, on Sunday, 21 July 2018, pray at the site where Kenya Urban Roads Authority demolished churches, schools and houses. Source: Reuters.